When we were looking for a new church following moving, we visited several churches. It seemed they either didn't have the music which Billy Ray needs to calm him enough for him to stay reasonably quiet during the rest of the service or they were not able to accept his occasional speaking out. Finally, I started calling pastors and inquiring before we visited because the process was difficult for Billy Ray and his Mom. When I called Pastor Ray Jones, then pastor at Soul's Harbor Church of the Nazarene, to inquire how receptive his congregation would be to Billy Ray he asked if I had considered attending without Billy Ray. I said an emphatic "no". In all fairness to Pastor Ray I have to tell you that this church was his first pastorate and he was new out of Bible College. We visited Soul's Harbor. Billy Ray was always treated okay but it took a while for him to be totally accepted. 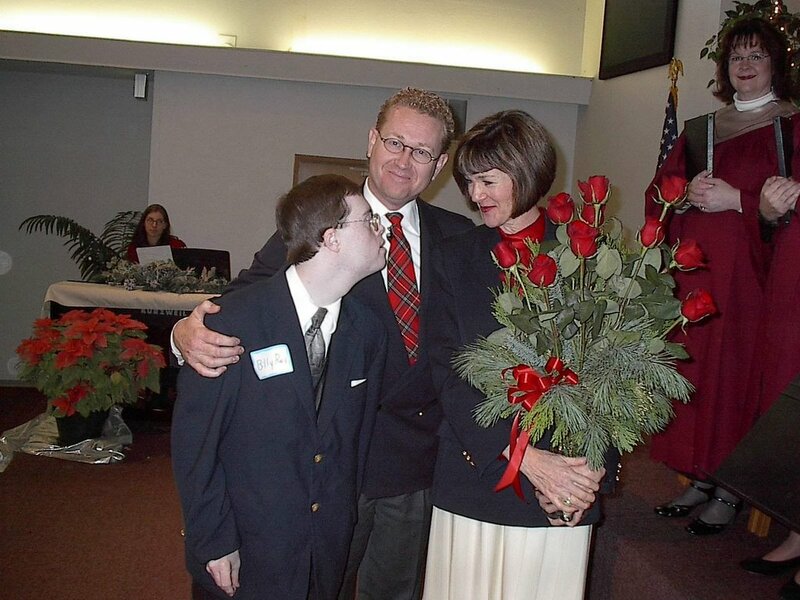 The thing that seemed to bloom immediately was his relationship with Pastor Ray and his wife Christine. It seemed Pastor Ray was working Billy Ray into his sermons on a regular basis. One time he said "we want more of the Billy Ray's in our church." Another time he was preaching on relationships and he eluded to his relationship with Billy Ray as something very special and it truly was. The relationship with Christine was very special to Billy Ray. I remember the first time he tried to take her hand unexpectedly she sort of cringed. I was not shocked by that because putting myself in her position I could see that it was a bit strattled for basically a strange man to run up grabbing at her. His love for Christine was so clear to her and others. She called him her biggest fan because he would become agitated when we had special music preferring Christine to sing. He had to know she was at least there even if someone else was singing. During the six years we are at that church Billy Ray was quite ill. He was too sick to be in church. I told Pastor that Billy Ray was saying "I want Christy-deen to sing to me". They had a CD that Christene had made several years before and Pastor made a copy for Billy Ray. He loved it so much it wore out and Pastor had to make him a new copy. You can see the awe in his eye contact (which he doesn't often have for others) in the above picture taken at that church the last Sunday before we moved to LaPine. Billy Ray loved to give Christine flowers on her birthday or following a muscial presentation. Here is he is giving her one last bouquet. It is amazing the beauty that can occur when you put forth the effort to help your complex child establish relationships. Sometimes it can feel awkward but it is well worth it. What a precious picture! His adoration for her is so obvious and sweet. He is very lucky to have experienced such meaningful relationships.